Orangespine unicornfish are characterised as having two pairs of modified scales on the base of their tail that are very sharp. They can be made out very well in the orangespine unicornfish, as the fish is black and the scales orange. Its maximum size is 50 cm. 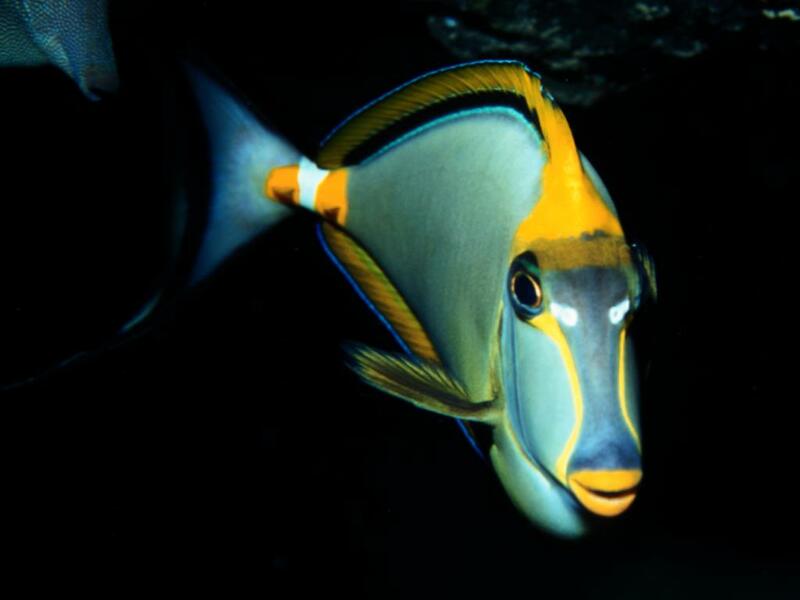 The orangespine unicornfish lives alone or in a pair, occasionally in a group. It feeds on leafy brown seaweed such as sargassum and dactyota, and is therefore a herbivore. Its reproduction is oviparous and they spawn in pairs. This fish lives on rocks or coral remains in exterior lagoons and reefs, at depths of 5 to 90 m. It requires a lot of space to swim and holes to hide in. The orangespine unicornfish lives in the Indian-Pacific, from the Red Sea to Japan, New Caledonia (Oceania) and Hawaii. The larvae develop long spines on the dorsal and ventral fins that are probably poisonous and help them to protect themselves.